While basketball takes center stage during the Big Dance, March Madness would not live up to the hype without the crazy fans, dedicated cheerleaders and rocking school bands. For years bands have looked at ways to share their school spirit while bringing music to the masses. From uniforms and face painting to crazy hats and sunglasses, basketball fans see it all in March. 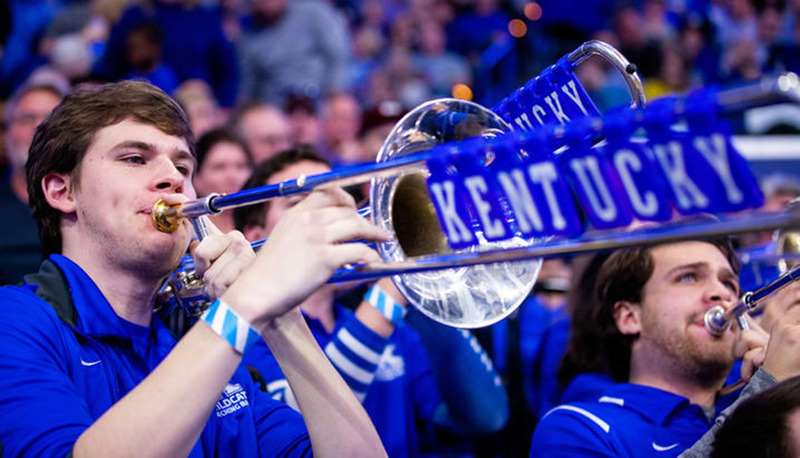 And this year, Kentucky Wildcats fans have likely noticed something else — trombones with flair. University of Kentucky computer science and mathematics junior and Pep Band member John Schulz, from St. Louis, Missouri, has found his own way to bring not only music to the game but also Big Blue colors to the stands — 3D tiles spelling out his allegiance to the Wildcats. "In the alumni band there is one mellophone player and they have — I don’t even know how to describe it — it’s like this big bucket on the end of their bell. It’s got lights flashing and everything," Schulz said. "So, I was always trying to come up with something that was a feature, but it’s obviously not the main focus." Schulz started working on a sleeve, which many bands use, but with some serious bells and whistles added. However, he couldn’t picture it just how he wanted. Then Schulz started thinking what if he did something on the slide because of the amount of free space. He decided to create something that is less damaging than an elastic sleeve that might break off and harm the instrument itself. Using skills he developed in his engineering courses and working at UK College of Engineering's Innovation Center, Schulz developed a 3D design for printing tiles that would spell out his message and attach at the top of the valve slide. "I decided to do it out of plastic; it’s something a bit more malleable. I’d say I probably went through six or seven major design iterations, obviously with slight tweaks in between, to get to a printable state." After seeing the set of tiles on Schulz's instrument, UK Athletic Bands Director Dana Biggs, in the College of Fine Arts' School of Music, was excited to work with the musician to get tiles for every trombone player in the band. "I think anything they can do to help build spirit and to represent Kentucky is really neat and adds a lot to the atmosphere. CBS usually does most of the NCAA tournament, and they're all the time looking for those sort of things, and the bands kind of lead that kind of fan craziness a lot of times at tournament. Face paint or blue hair or whatever it is that they come up with is really cool to me." A former trombone player himself, Biggs has enjoyed seeing the evolution of what band members do to help cheer on the team. "What's really cool to me was, I used to be in the band here at UK, too. I was in undergrad and I was a trombone player. And back in one of the tournaments we decided we wanted to put Kentucky on our slides, and we went to a materials shop that was across the street from our hotel on one of the trips and we did iron-on letters. It's come a long way since the time when I was in band, which was back in the '80s and early '90s." Schulz, who one day would like to work in Silicon Valley, estimates it takes him about a week to create a set of tiles for one trombone. He spent much of December creating the tiles that read Kentucky for his section to wear at Rupp Arena and Memorial Coliseum, the Southeastern Conference (SEC) Tournament and now during March Madness. And, the "bandgineer" who wore tiles that read "Snell Yeah" during football season isn't ruling out a new set for the tourney or for other trombone players. But he has his limits, "If it’s Louisville, you know you got to turn it down." Big Blue Nation will likely see Schulz's handiwork on TV this month. But if you are lucky enough to attend an upcoming NCAA game for the Wildcats, you can also catch UK Pep Band playing pep rallies hosted by the UK Alumni Association on gameday during both the men's and women's basketball tournaments. Entertaining thousands of fans with spirited, high-energy performances, the UK Pep Band, part of the Wildcat Marching Band, enjoys a national reputation as one of the finest collegiate bands in the country. Representing UK in multiple capacities from gamedays to university announcements to community events like "see blue." Day at Keeneland, the bands play more than 100 events every year. Any UK student is eligible to participate in UK's band program; current members represent 61 different majors on campus.